Poolife Turbo Shock shock treatment is a powerful treatment with more of the benefits pool owners look for. 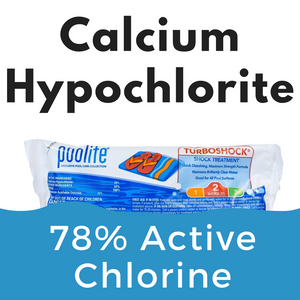 With 78% minimum available chlorine, poolife TurboShock shock treatment works fast to combat algae and bacteria. It dissolves more quickly and completely and keeps pool water sparkling clean and clear with less work. Dosage: 1-lbs per 10,000 of pool water. Increase dosage for Green Pool Water.